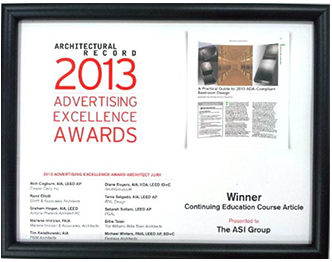 At the 2013 AIA Show in Denver, CO, the ASI Group received the Award for Continuing Education at the “Architectural Record – 2013 Advertising Excellence Awards” breakfast. A very objective category, the award was given because the course provided by the ASI Group had the most CEU tests taken since September 2012. Plus it was also the fastest growing CEU Course at McGraw Hill beating out courses that were posted online for over 18 months (online for just 9 months)! The course is accessible below.